Journey 2: The Mysterious Island takes place a few years after Journey to the Center of the Earth, and gives us an incredible trip into the world of Jules Verne. One of the most fun family movies I have seen in a while, it is a lighthearted adventure that kids and parents alike can appreciate in their own ways. Ever since losing his father in the first film, Sean Anderson (Hutcherson) has been obsessed with everything Jules Vern. He considers himself a “Vernian,” and spends most of his time and energy on talks revolving around the author. Sean believes his grandfather Alexander (Michael Caine) is trapped on The Mysterious Island, a place from one of Vern’s books of the same name. He finds a secret code that has been encoded by another Vernian, but can’t solve it without the help of his mom’s boyfriend Hank (Dwayne Johnson) – an ex-Navy code cracker. Convinced that the answer will lead him to the island and his grandfather, Sean enlists Hank to travel with him on what seams to be a crazy journey. Along the way they meet up with Gabato (Luis Guzmán) and Kailani (Vanessa Hudgens), a helicopter pilot and his daughter who are the only pair of people who will go near the coordinates they present. After flying straight into an unexpected hurricane, the group washes up on the shore of The Mysterious Island – proving that Sean and his code were right. I have to be honest – going into the movie I did not have high hopes. I figured it would be an OK kid’s movie, but it really isn’t my cup of tea. My son is a huge fan of anything animated, so that is most of what we watch at home these days. But to my surprise, my two-year-old was quite mesmerized by the fantastic world captured in the film. Also, the story was quite fun and the writing was too. By the time the credits rolled, I had realized that not only was the movie pretty good – but I had a fun time along the whole ride. It was also at the credits that I realized the screenplay was written by two cousins from St. Louis – Brian and Mark Gunn. And I’m not just saying this because the film has a St. Louis connection, but the characters and story were very well written. I kept waiting for some really dumb lines to come out of the characters’ mouths – especially “The Rock’s” – but what I saw was actually quite charming and fun. Dwayne Johnson has had his share of cheesy roles in kid’s movies, but he has also proven himself as an extremely charismatic actor. The wrestler-turned-actor does a great job of actually acting – something that the other wrestlers that have recently turned Hollywood should brush up on – and does a good job in the role. Hutcherson is a natural as the rebelling teenager who doesn’t care for his mom’s new boyfriend, and him and Johnson have a fun time bumping heads throughout the film. Johnson and Michael Caine even get into, exchanging banter as they prove their manliness. I don’t have much to say about Hudgens, beside from the fact that she does a fine job. But I do have to give Luis Guzmán props for being pretty funny. He is the comic relief, if you will, and the guy is pretty great in whatever he is in. He is one character actor that doesn’t get enough credit. The visual effects in the film are jaw-dropping at times, and the entire island is quite stunning. Unless the filmmakers really did crack a secret Vernian code and end up on The Mysterious Island, I am pretty sure that most of the movie was filmed on green screen. Yet I really can’t remember a time from beginning to end that the CG looked fake. Bad computer generated effects and scenery are the killers of most of these types of movies, but this one is far from suffering that fate. The island is pretty incredible, especially on the big screen, and the 3D is icing on the cake. It is one of the few movies that really benefits from the technology, giving you the feeling of being right there for the adventure. 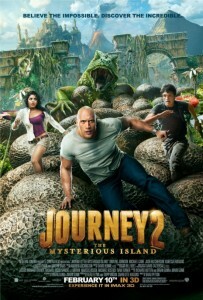 Journey 2: The Mysterious Island is a great escape from reality, and is a great trip for kids and their parents. There is nothing worse than being trapped in a theater watching a kid’s movie that has no redeeming qualities. But luckily for us parents, this one let’s you channel your inner-child and just have a fun time.